Reading and Brighton are said to be stressful places to live. So what? If you fancy a better life in the country, remember those places aren't always what they seem – just look at Midsomer Murders. 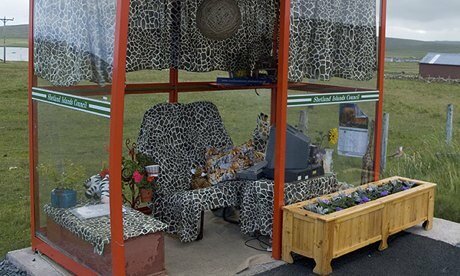 The quiet life: Unst’s award-winning bus shelter, Shetland – all set for long waits. I was very surprised the other day to read that commuter towns are the most stressful places in Britain. I thought the most stressful places in Britain were the toilets at Glastonbury festival, Cleethorpes leisure centre’s new unisex changing areas and the writers’ room for the current series of Downton. But they are not. A wellbeing survey, carried out by the Office for National Statistics, found that the most anxiety-ridden places to live in Britain were Reading, Slough, Milton Keynes and Brighton. I’ve just been to Brighton to do a comedy show about feminism. No one seemed stressed out to me, apart from a man in the front row who’d clearly come by mistake. Personally I couldn’t live in Brighton or anywhere near the coast as I have irrational fears about rising sea levels, those horrific sea serpents that washed up on a Californian beach last week that some believe foreshadow a major natural disaster, and local art. Unsurprisingly, Shetland, where I accidentally went for my honeymoon, was one of the least anxious places to live, with the highest levels of life satisfaction, self-worth and happiness. That could be explained by the fact that there isn’t anything or anyone there. You’d need to have a very good imagination to feel anxious in Shetland. You have to really want it, bad. I’d even go so far as to say that you’d actually have to go looking for it. Even if you had the most detailed Ordnance Survey map of the island, which we did, I still don’t think you’d be able to find anything. Or any stress. According to one woman I spoke to who worked for the RSPB, even birds don’t go to Shetland, because there’s nothing for them to do or eat there. It’s so windy and so cold and so isolated that very few plant species visit the islands. Even the weather doesn’t go to Shetland. I did though. For my honeymoon. In December. One of the highlights of the week was when I saw a chicken by the side of the road. Our honeymoon photos are not your traditional honeymoon photos. Hundreds of pictures of an empty, hostile landscape, and then one of me, pointing at a chicken. All the photos came out really dark as well, because light doesn’t go to Shetland either. Not at that time of the year. I can’t remember what the other “highlights” were. Beautiful island though, if you’re not into doing or seeing anything. Cary Cooper, professor of organisational psychology at Lancaster University, said that money may be tight in the Scottish isles, but time to stop for a chat is in abundance. I can’t argue with that. One day we were lucky enough to have a lovely chat with a local man. We were admiring the island’s major tourist attraction, the award-winning Unst bus shelter (a bus shelter with some furniture and an old telly in it), when he pulled up alongside us. He asked us where we’d come from and when we told him London, he pointed to the bus shelter and said: “You wouldn’t get this in London, would you?” “No, you wouldn’t,” we replied. Then he drove off, at some speed, triumphant in his bus shelter victory. Cooper also said the sacrifices commuters made were rarely acknowledged. We have the longest working hours in Europe, then spend additional hours getting to our jobs and this leaves us exhausted with no time to invest in our neighbourhoods, family and friends – the things that are supposed to make us happy. Although, if we’re honest, we must admit that our friends, family and stifling neighbourhoods are often the very things that drove us away in the first place. David Cameron, who is no stranger to the stress of other people and who only went into politics to ensure a better work-life balance for himself, says that measuring national wellbeing is as important as measuring GDP. Michael Gove, the education secretary, also supports measuring stuff. Not trivial things such as how qualified or unqualified the teachers who work in his academies and free schools are, but the important things, like his own waistline. We all dream of a better life in the country: a garden for the children, a view of a tree, less knife crime, but those places aren’t always what they seem. Look at Midsomer Murders. No wonder John Nettles gave up being a rural policeman and came back to London to head the Met’s counter-terrorism command. We’re all searching for utopia, but it doesn’t exist, and if it does (which it doesn’t), I’m pretty sure it’s not in Slough or Reading. My advice to commuters is to make a virtue of your commute. Beat it at its own game. Don’t see it as dead time. Set a challenge each day to achieve something during your journey. Learn how to make sushi, how to play an instrument or practise free-jazz vocal-improvisation. You’ll not only achieve something, but get a seat as well. It’s win-win. I’m staying in London for now, for work. It has the best, most diverse standup circuit in the world. If I did move to Shetland, I’m not sure how many people would come to see me. Not after this column anyway. I’d have to change careers. Perhaps I could work for the Shetland tourist office in town? The first thing I’d do was open the door. It was closed the entire time we were there.